Over the summer it was a blessing and pleasure to get to meet and spend time with Chris Haw when Chris and I were both speakers at the Theology and Peace conference. Theology and Peace is devoted to working out the insights of Rene Girard with the aim of producing more peaceable communities, locally and globally. So Chris and I talked a lot about Girard when we were together. But we also spent some time talking about Chris's recent conversion to Roman Catholicism. Those were great and stimulating conversations, so I was really looking forward to Chris's book finally coming out, From Willow Creek to Sacred Heart. The first part of the book is a spiritual memoir. While Chris was born into the Catholic faith he really fell in love with Jesus at Willow Creek during his high school years. 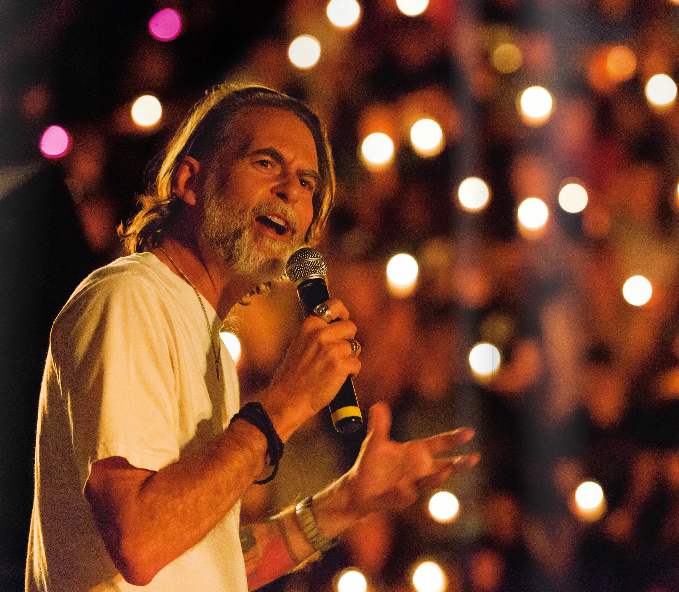 During his time at Willow Chris became friends with Shane Claiborne. Chris eventually made his way to Eastern University where, with Shane and people like Jonathan Wilson-Hartgrove, Chris became a part of the new monasticism movement. Two big themes emerge in these early chapters. The first is Chris's growing concern, after an exposure to Wendell Berry, with issues of sustainability. The second is Chris's activism in regards to the wars in Afghanistan and Iraq (and war generally). Following the new monastic impulse, after college Chris and his wife moved to a drug-infested and violent neighborhood in Camden, NJ. And across the street from their house was Sacred Heart church. One of the things I really like about the new monastic movement is how many of these communities don't start or plant new churches. Rather, they go to the churches already in the neighborhood. So Chris started attending Mass at Sacred Heart. And, over time, this eventually led to Chris coming back to the Catholic church. The first part of the book traces out this journey. 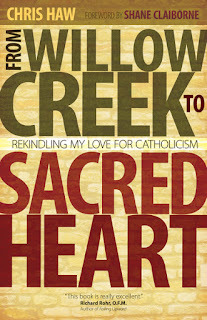 For comparative purposes, the first half of From Willow Creek to Sacred Heart is very similar to Shane's memoir An Irresistible Revolution. But what makes Chris's book different is the second half of the book where he gives his reasons for converting to Catholicism. The second half of the book is more theological and mainly addresses a variety of questions and objections people raise about Catholicism and the Catholic Church. For example, Chapter 9 is entitled "On Being a Part of a Terrible Organization" and it deals with Chris's conversion to Catholicism in the midst of the child abuse scandal. Let me point out two chapters in Part 2 that I really liked, as these were the subjects Chris and I discussed last summer. Instead of seeing the eucharist as my own private portion of sacredness, I came to see them as drawing me into Christ's profoundly different way of living in the world...When we eat together the Bread of Heaven, the Eucharist is a performance of uniting--both the people gathered locally and globally--and of making ourselves one with the Victim. A theological resource here, one that Protestants generally lack, is a focus on the tortured body of Jesus. In Protestant churches you see crosses. But in Catholic churches you see crucifixes, a cross with a tortured body upon it. To be sure, many Protestants find this image problematic. Too gruesome and bloody. This is understandable if you are working with a view of atonement like penal substitutionary atonement. But from Chris's perspective (a perspective I share), a perspective informed by Girardian thought, the divinization of the tortured victim, a historically distinctive aspect of Christianity, is the greatest, most profound, earth-shattering and life-altering insight of the Christian faith. Christians deify the Victim, worship the Victim. And from this perspective I agree with Chris that the liturgical resources of the Catholic faith are better positioned to bring these themes to the forefront. I can see why someone who has been influenced by Girard would be attracted to the Mass, where the body of the Divine Victim is more visible (and mystically present). In fact, for very similar reasons I've begun to incorporate some Catholic devotions that dwell on the body, blood, and wounds of Jesus into my own prayer life. Let me also mention another really great chapter, Chapter 8 "The Search for No Accent (Or, The Impossibility of Nondenominationalism)." This chapter is worth the price of the book. In Chapter 8 Chris takes on the Protestant conceit of "nondenominationalism." This subject is of interest to me as I come from a faith tradition that describes itself as nondenominational. The basic idea behind nondenominationalism is that we can skip the history, traditions, and institutions of the church and just get back to Jesus and the Bible. When I look at my students' Facebook profiles under religion affiliation I often see "I love Jesus!" or "Jesus follower." The idea here is that you can cut out all the bad stuff about organized and institutionalized religion and simply be a "follower of Jesus." In Chris's case he was working through the "nondenominationalism" of Willow Creek. What Chris came to realize was that Willow did have a creed and a tradition, that there were regulating traditions and beliefs. I came to realize the same about my own tradition. We claimed that our only guide to faith and practice was "the bible." But the more you poked around and questioned things the more you realized that "the bible" was simply a cipher for "the way we interpret the bible." In short, there is no such thing as "nondenominationalism." Nondenominationalism is an impossibility. You always have a bias, a stance, a hermeneutic, a regulating tradition, a stated or unstated creed. There is no "view from nowhere." What is perhaps most frustrating about engaging in such conversations within the evangelical community in particular, however, is that differences regarding things like Calvinism and Arminianism, baptism, heaven and hell, gender roles, homosexuality, and atonement theories often disintegrate into harsh accusations in which we question one another’s commitment to Scripture. In some cases, folks are so committed to their particular views on these issues they seem incapable of making a distinction between the Bible itself and their interpretation of it, and so any critique of that interpretation is seen as a critique of Scripture itself! Many Protestants have made this same observation. But Chris goes further as Catholics have a bit more to say about all this. Chris would argue that the divisiveness Rachel is speaking to--all these "competing interpretations"--is the fly in the ointment of the Protestant program, the crack in the foundation. Protestantism is unable, due to its structural flaws, to create the unified community of celebration Rachel envisions. The problem is this. Protestantism worships at the altar of individualism. In this Protestantism is the great handmaiden of the Enlightenment. The highest authority in Protestantism isn't God or the Bible. The highest authority is the individual conscience. If you don't like the particular teachings of a church you just walk away. Or start your own church. Thus the history of fracturing, spiting, and ramifying we've seen throughout Protestant history. There is one Catholic church. How many Protestant churches? Exactly. That's the point. And the problem. With the individual conscience as the final arbiter there is nothing that holds Protestantism together. But Chris's argument goes even deeper. These divisions within Protestantism are often motivated by the conceit that you can get beyond or behind the tradition to the "real Jesus." But as Chris points out, there is no Jesus outside of the tradition. There is no pure Jesus, a Jesus uncontaminated by the tradition. In fact, the tradition is what gives us Jesus. Thus, to love Jesus is to love the tradition that brings you Jesus. The two are of a piece. To love Jesus is to love the church tradition that brings you Jesus. This, I think, is where From Willow Creek to Sacred Heart is poised to very influential. The book is one of the most accessible presentations of the Catholic criticism of Protestantism and nondenominationalism that I've ever read. And even if you ultimately disagree with Chris and Rome, exposing yourself to Catholic ecclesiology will help you puzzle through your own church issues and problems. For example, I've become much more sympathetic to the Catholic criticism of Protestantism as I've been shaken by recent events in my own local congregation. In the face of these crises, the question I keep asking myself is this: How is my church any different from Facebook? What binds us together past our "liking" this particular congregation? Because when the hard work comes--the work of accountability, discipline, discipleship, mission and sacrifice--mere "liking" isn't going to be strong enough to hold us together. In fact, I know--painfully so--that it's not enough. Because the minute we start to "dislike" our church we can just pack up and go somewhere else. It's spiritual consumerism at its best. To conclude, I should perhaps end with the million dollar question. In the end, did Chris convince me to become a Catholic? Not quite. 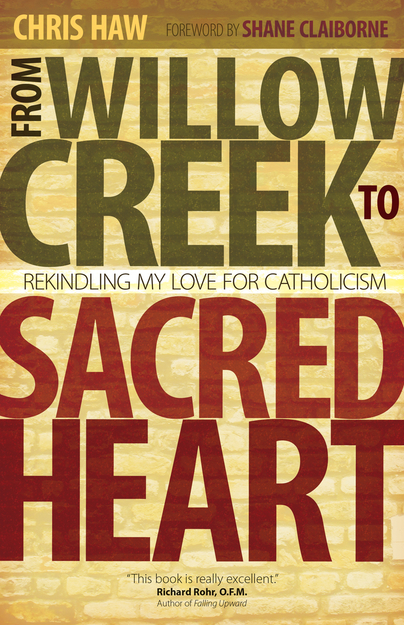 But I'll tell you what From Willow Creek to Sacred Heart did do for me and why you should read it. The book has made me a more reflective, restless and humble Protestant. (The book also rekindled my love for G.K. Chesterton.) The book has helped me internalize a Catholic perspective and sensibility that will forever shape how I view my faith and church. Chris's book will haunt me. And for that, I'm deeply grateful. Really loved this one, but as a Catholic - albeit a poor specimen of catholicism - maybe I was bound to.. I also loved the typo: " So Christ started attending Mass at Sacred Heart.". Though, again as a Catholic, I would point out that Christ has been attending Mass since the institution of the Eucharist! As a long time Baptist I have been taught to ignore, be fearful of and fearful for, all things Catholic. That changed as I watched a presentation of the Eucharist on a Catholic tv station. It was very moving in a way that I had rarely been moved in Baptist presentations of the Lord's Supper. Not that I have converted but realized that maybe they have some things right. Also you mentioned Wendell Berry, one of my favorite authors. I read this just this morning. I must say, that as a former Willow Creek attendee, and a Protestant, I was offended by this. But that's a good thing. Because I wasn't angered, but my heart and sensibilities were pricked. Becoming smug in my following after Jesus in my own way may just be pride in my own ability to think. Or not. But at least I have to think about it after reading this. Having a relationship with Christ, however, and his Spirit, I know that I have not been completely off base. I know that I have grown and endured unimaginable pain in the loss of my only child just fine as a Protestant and follower of Jesus. By the same token, I appreciate the Catholic church more now. I still have questions and the church still bothers me, but, I have always desired there to be a unity in the body that I've never really seen. I believe that my membership in the United Methodist Church is a very good thing. I believe the philosphy behind this church was inspired and that is also good. I believe God has led a great many people - at the cost of many lives, to break away from the Catholic church and that he planted seeds of unrest in their hearts for a good reason. Yet I would also contend that God has brought some healing between Protestant and Catholic and I hope that continues. And, now, I am just rambling. Forgive me. God bless all of his children. Whence does the Tradition take criticism? Prophets whose blood is shed by priests? I admit the historical stuff is hard for me to get around. The theology I like, the history makes it hard. This is pretty compelling stuff. As I finished reading the post I found myself wondering what your reasons are for not converting to Catholicism? Is it mainly the "historical stuff" you alluded to in another comment? I have concluded, for now, that it is my job and goal to make a difference wherever I'm planted. No matter where I go, there will be tough soil and tough people. I remind myself often, I am not the Messiah, don't try to act like it. Lots of different reasons. Some of them dealing with the behavior of the church throughout history. Some because I think you can accept the canon (and the Jesus of the canon) as mediated without accepting the ancillary stuff related to the Catholic church past the creation of the canon and the creeds. That is, we are all "orthodox" or small c "catholic" insofar as we are creedal and canonically biblical. Though such a recognition does necessitate coming to grips with the fact that Protestantism is tethered to the Catholic tradition. A necessary connection (or foundation) that many Protestants don't recognize or embrace. Further, the Catholic church doesn't own the early church. The Orthodox are in the mix as well and we could just as well argue that Catholics should be converting to Orthodoxy. Catholics often forget this. And finally, a lot is personal/autobiographical, about growing in the tradition that brought you to the faith. In the introduction of his book, Chris mentions Richard Rohr, a Franciscan priest. (Chris seems to have been influenced by his writings.) I have included a link to Fr. Rohr's web page that you, or perhaps some of the readers, may be interested in reading. His talks, writings, and thoughts remind me of yours, except that Fr. Rohr is Catholic! Even if we decide that we should return to a more ancient, traditional faith community, the Catholic Church isn't the only option. Church splits have been going on for millennia. In the end, I believe, it truly does come down to our individual conscience. And conscience vs. community certainly isn't the only tension of Christianity that must be managed. I do sometimes fear that Protestants have over-compensated from their conceit of a tradition-less Bible and thrown out the baby with the bathwater. There is an old, important debate--a debate which thoughtful Catholics affirm and take part in--about the extent to which Scripture is not simply "whatever our tradition says it is," but in fact can stand as a corrective of all of our traditions. (I think the Latin here is norma normans versus norma normata.) Hence the "back to the sources" fervor of (say) Erasmus as well as Luther or Wesley or Alexander Campbell. But yes, for many of us caught in the Bible belt, living with a tradition--and recognizing that we are, in some sense, outgrowths of a church that for many centuries was largely Catholic--is healthy. Thanks for this whole discussion. Incidentally, I want credit for using the word "ramifying" in today's post. Sometimes I think you should just round up all the Christians from Abilene and the tribe I grew up in and just dump them geographically into areas where there isn't a church of their preferred choice on every corner and see how they cope with that scenario. First, kudos for using "ramifying." This is a fascinating post - reminds me of Thomas Howard' Evangelicals on the Canterbury Trail from several years ago. Through my own reformation studies, I really came to appreciate the rupture that happened in the early modern period and its consequences for both church and modern life. And also that there was plenty of blame to go around for why things turned out the way they did. What concerns me is that the Magisterium seems incapable of reopening a conciliar conversation. I think this may be virtually impossible to overcome in any one lifetime, if ever. I wonder, too, in that light, if one might be able to re-articulate a protestant ecclesiology (drawing from Tillich's protestant principle) that overcomes the ahistoricism so common in "nondenominational" theology and practice. In other words, could we have something that acknowledges protestantism as a tradition (and here I'm thinking along the lines of Jeffrey Stout's Democracy and Tradition)? Hmm. I think some of his arguments sound suspiciously like straw-men, but I think he raises some important points, whether they actually argue in favor of Catholicism or not. To a large degree, the protestant reformation fell well short of reforming much of anything anyway; sort of the emperor's new clothes in some respects. Catholicism today is actually not terribly different from Protestantism except in formality and some unique doctrinal positions. Personally, I'm more or less of the mind to throw all 'tradition' out, regardless of what label one puts on it, because ultimately they are all the traditions of men. Great point about the Roman church not owning the early church. There is a solid historical argument for Orthodoxy if you don't track with Papal authority, and of course I would argue that classical Anglicanism is thoroughly catholic and Patristic as well. I know you've written very positive things about the Orthodox Church, but here's food for thought: I've also seen the Orthodox described as a sort of "in-between" of Protestantism and Catholicism. Which I wager is also where you are theologically. Thanks for the thoughtful interaction Rich!!!! Thou art not far from Rome brother Richard. I am also a cradle catholic that returned to ‘the Church’ many years ago. I wish I could say it was because of the thoughtful, rational/theological reasons brother Haw elucidates so well. But really it was more for the spectacle, ecclesiastical bling, the embrace of mystery, the superstition (in the best sense of the word), the spiritualism of mystics like Hans Urs von Balthasar’s haruspex Adrienne von Speyr, the counter balancing to all the testosteronic infused mega-church swinging dicks with the Catholic devotion to the blessed Virgin Mary, and of course the movie “The Godfather” (especially this baptism scene http://www.youtube.com/watch?v=1CDlBLvc3YE ). Like Joe Kennedy use to say, the protestants have the east coast Anglican mob and the U.S. military to do their killing (like the Bush family) we Catholics have the rosary and La Cosa Nostra). Obliged. Oh, and hey, we don’t need no more ‘cafeteria catholics‘ In the RCC who often remind me of the Karaite Jews I’v had to deal with in Israel many times who reject the Talmud and tradition. If you go Catholic go whole hog, and don’t just pick the bac-o-bits off your baked potato and then try to call it Kosher. blessings. I discovered Orthodoxy about a year ago, and have been intrigued by it. I think it was a blessing, although I don't get near enough sleep anymore because I stay up late almost every night trying to read what I can. One big thing I have learned in the process is the statement you made above about “the fact that Protestantism is tethered to the Catholic tradition. A necessary connection (or foundation) that many Protestants don't recognize or embrace.” (When you say Catholic, I’m assuming you mean Roman Catholic.) How we can ignore the obvious . . . I don’t know, but the overwhelming majority of Protestants have - me included. Having grown up in churches of Christ and continuing to be a part of its movement I thought we were different. But no . . . we aren’t!! We too are tied to the Roman Catholic Church. It’s almost funny that we are blind to it. No it’s not funny, it’s pitiful. So I’ve been wondering. Are there any in churches of Christ that are discovering Orthodoxy? With all those students investing time in the study of church history and theology at ACU, Harding, Lipscomb, etc. has anyone woken up to what has happened and to what we have lost or given up? Is there a discussion going on somewhere about what we should be doing to reclaim Tradition? Notice I say “we”and not I. Just wondering. I discovered Orthodoxy about a year ago, and have been intrigued by it. I think it was a blessing, although I don't get near enough sleep anymore because I stay up late almost every night trying to read what I can. I haven't converted, not yet anyway. The statement you made above about “the fact that Protestantism is tethered to the Catholic tradition. A necessary connection (or foundation) that many Protestants don't recognize or embrace” has stood out in my studies. (When you say Catholic, I’m assuming you mean Roman Catholic.) How we can ignore the obvious . . . I don’t know, but the overwhelming majority of Protestants have - me included. Having grown up in churches of Christ and continuing to be a part of its movement I thought we were different. But no . . . we aren’t!! We too are tied to the Roman Catholic Church. It’s almost funny that we are blind to it. No it’s not funny, it’s pitiful.So I’ve been wondering. Are there any in churches of Christ that are discovering Orthodoxy? With all those students investing time in the study of church history and theology at ACU, Harding, Lipscomb, etc. has anyone woken up to what has happened and to what we have lost or given up? Is there a discussion going on somewhere about what we should be doing to reclaim Tradition? Notice I say “we”and not I. Just wondering. How we can ignore the obvious . . . I don’t know, but the overwhelming majority of Protestants have - me included. Having grown up in churches of Christ and continuing to be a part of its movement I thought we were different. But no . . . we aren’t!! We too are tied to the Roman Catholic Church. It’s almost funny that we are blind to it. No it’s not funny, it’s pitiful. So I’ve been wondering. Are there any in churches of Christ that are discovering Orthodoxy? With all those students investing time in the study of church history and theology at ACU, Harding, Lipscomb, etc. has anyone woken up to what has happened and to what we have lost or given up? Is there a discussion going on somewhere about what we should be doing to reclaim Tradition? Notice I say “we”and not I. Just wondering. I don't know how that happened! I find it interesting that many have started using the term "undenominational" rather than nondenominational. Does it really change anything? To call any group or individual non or undenominational labels them as such. So to claim to be non or undenominational is naming oneself and to become a denomination. Just one more term that adds to the confusion. "In fact, for very similar reasons I've begun to incorporate some Catholic devotions that dwell on the body, blood, and wounds of Jesus into my own prayer life." Could you share some of the ones you've found meaningful? My journey was from baptism in 1955 at Palmerdale, Alabama, United Methodist Church to Trinity Episcopal Church, Lewiston, Maine where I serve as rector, coach and colleague. Another good read would be Almost Catholic by Jon Sweeney. It was quite influential in my journey from growing up Catholic to coming to Christ through Willow Creek-like faith communities and then returning in some ways to the Catholic Church. The go-to meditations here are the Stations of the Cross (there are traditional and biblical versions, I think Protestants would be more comfortable with the Biblical Stations). Usually these are for Lent, but you can use them anytime. There are also Devotions to the Five Wounds and litanies to the Precious Blood. I also bought a crucifix. I prayed this one every day for 3 weeks for my sister-in-law while she was dying. In case you don't know, an akathist is prayed standing (the word means not-sitting) if at all possible. It is in 13 sections, with 2 parts to each section; the first part describes the person or event, and the second is a sort of mini-hymn expressed on contemplation of it. At the end, a sort of summary prayer is said 3 times, and then the first 2 parts are repeated, but in reverse order. Contemporary akathists maintain the original form, but are hardly ever now composed as a Greek alphabet acrostic, as at first. I love your comments Daniel. I do have a lot of Mass under the bridge having gone to Catholic schools from 6th-12th grades. Thank you for the provocations. Blessings to you and yours in NJ. Yeah, sort of a mutt. I haven't read Stout, but what you suggest sounds very much like where we need to go. I don't think many in the CoC even know what Orthodoxy is. 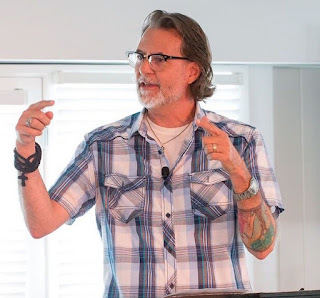 Those who get an exposure to Jeff Childers in our graduate programs at ACU will be introduced to the eastern church fathers, but that's a small group. There is no mainstream engagement. Only my blog I'm guessing. Thanks so much for this Dana. I'm still learning so many things. David, I pray you get some sleep. Oh, and since your interested in Odoxy, when you get the time maybe read 'The Brothers Karamazov" (if you haven't already). Even though Dostoevsky really hated the Roman Catholic Church (the kind of bitter, visceral hatred you find among siblings sometimes) nevertheless that's a good intro into a wonderful, really astonishing faith (as long as your not looking for something to make you feel better). Blessings on your journey. You are not the first person to receommend "The Brothers Karamazov". It must be good advice. Indead I think I will read it. Thank you Daniel. I checked out Terry Cowan's site. It is really good? He writes well. Thanks so much Dana. Jeff Childers. Are you reading this???? I know where your office is. And I'm going to find you. Richard, as an undergrad at ACU, when I was in my really-tired-of-Stamps-Baxter-phase I went to daily mass at St Francis. I don't think they have it now, this was in the late '70's. The quiet contemplative fellowship with those coming in either before or after shift work was a different expression of faith from what I was used to -- not so outward. A compelling lead to teach me how to reflect, in counterpoint to the way I had been raised, inwardly about my relationship to Christ and the cross. Great question and is the primary reason I'm not Catholic. The locus of the Word is the church but not merely the church. The Word is also external to the church and thus gets to critique it. "Thus the history of fracturing, spiting, and ramifying we've seen throughout Protestant history." "The problem is this. Protestantism worships at the altar of individualism. In this Protestantism is the great handmaiden of the Enlightenment. The highest authority in Protestantism isn't God or the Bible. The highest authority is the individual conscience."